It's been a week since the wild week of blog posts-- and a busy week, too. I started a writing course at University of Sydney (just 6 weeks), and I've got two author interviews lined up this week, too! I haven't been able to contribute to Final Draft in awhile, but recently Craig and I were both on Final Draft, getting interviewed about our jointly-owned miniscule bookshelf. You can listen to us on the podcast here-- Ben did a great job editing it; you would never know we talked for hours over dinner, wine, and a dessert of Koala Nose cookies. Our segment is the last of three on the episode "Gaining Ground," but the first two segments are awesome, as well, so I recommend just listening to the whole show. Here's a picture of the baby bookshelf. As you can see, it's not even just a bookshelf. 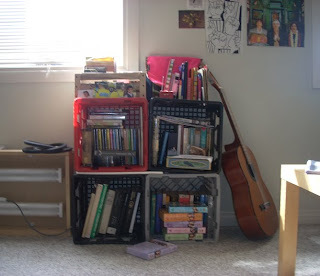 Four diminutive milk crates, and all the books I have here don't even fill them! It's also a DVD/CD shelf, guitar rack, magazine organiser, etc. Thinking of my book collection back home, my heart shrivels. My collection here is so young, so fragile. It's a cutting from a favourite, much bigger tree that lives back home, a cutting I'm trying to grow in foreign soil. This new young tree will be affected by its strange surrounds; already four of our volumes are about Australia or by Australians. You'll be glad to know Craig and I finally have some extra support...under our butts. After a full month of sitting on the floor to eat dinner every night, we got a lovely couch on Freecycle! 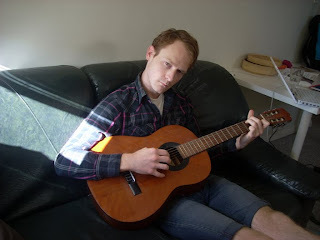 Another cause for celebration: Craig got a guitar! It's a classical one, and he got it used from an auction house (Mitchell Road, Australia's biggest auction house). He's been very happy about it, and our tiny apartment is once again filled with the melodious tones of Craig endlessly tuning his guitar. Bing bing bing bing bong bong bing. It's a pretty guitar, but not that pretty. Yet. I might stencil it with flowers. I don't know what he's so morose about; I think he might be getting tired of me. Or at least, he's getting tired of me taking pictures for the blog. Get used to it, loser! We've been cooking a lot lately, too. We've been veganyumyum devotees since Thanksgiving, and the recipes keep getting more complex and interesting. We gave the Thyme Vinaigrette and Lemon Cashew Cream Gnocchi a try. I couldn't get my hands on any fresh thyme, so I used basil instead. Also, I used whole wheat flour, but next time I'd probably stick with white bread flour. Regardless, they were delicious and heaps of fun to make. Sure the first batch I threw in the pot came out like soggy potato-mash. But I added extra flour to the second batch, and they came out perfect. Tender, moist, chewy. And warm pasta with vinaigrette and nutty cream? Genius. VeganYumYum's writer, Lauren Ulm, has finally put together a print cookbook. You can pre-order it on Amazon; I'm super excited. You should check it out. Tonight we tried her oatmeal-raisin cookie recipe. I've eaten four already. Oh, Lolo, what would we do without you? And if you're interested in getting something you need for free or finding a new home and new life for something you're ready to give up, get on the inter-worldwide-super-cyber-webnet-highways and see if there's a Freecycle in your town! I love So You Think You Can Dance. I love it best when I've taped it, so I can fast forward through the commercials, the extraneous acts they put on while the judges deliberate, and everything Mary Murphy has to scream. I used to do ballet, tap, and jazz, and I spent years prancing around my parents' living room in silly costumes, which is what dancing is mostly about when you're 8 years old. If this show had been around when I was a kid, I'm sure I would have been all over it, even more obsessed than I am now in my older, wiser years. I appreciate the storytelling that goes on during the dances; I feel like that is a really basic element of it. Dance has always been a way that people communicated stories. Music and movement; that is how we kept our beliefs, our spirituality alive. To be honest, I'm also interested in the storied choreography because I spent most of my childhood as a Bollywood bootyshaker. That's right, my most impressionable years were spent telling such very important stories (that needed to be kept alive) like "I was only eighteen, and I was caught by a handsome farmer in his farm--he was fresh, etc." Or like, "1, 2, 3, 4, 5, 6, 7, 8, 9, 10, 11, 12, 13!" Or my favourite, "The enemy of heart is coming today, today he will not be safe; he who erased my happiness, today I will erase him!" I'm not joking, my very first public Bollywood dance was Dushman Dil Ka from Roop Ki Rani, Choron Ka Raja. So last year, when SYTYCD introduced Bollywood dancing as one of their styles, I was super excited. I thought Katie and Joshua were beautiful. Their dance didn't tell much of a story, but I was willing to forgive it in all the excitement. This year, they had a professional classical Indian dancer come do a special performance; Jason and Caitlin gave the choreography a good try. But it's starting to bug me. Because this show isn't showcasing Bollywood dancing; it's showcasing fast, catchy Punjabi dancing mixed with Indian classical moves. Bollywood dancing needs to be done to a Bollywood song. It needs to have a story, lyrics. They didn't even discuss the meaning behind the professional dancer's moves. Bollywood dancing needs to be overwrought, with silly facial expressions, plenty of hip-thrusting and chest-shaking; it needs to be slightly slutty. This show is not getting Bollywood right. Cook the pasta to the al dente stage. Drain in a colander, toss with some oil and set aside. If the sundried tomatoes are the dry type, soak for a few minutes in hot water to soften them up. If they're oily, skip the hot water step. Drain (if applicable) and dice the tomatoes. Heat the remaining olive oil in a medium-sized pan over medium heat. Saute the garlic until fragrant and turn the heat to low. Add the diced sundried tomatoes, tomato paste, tahini, vinegar, yeast, and lemon juice. Stir to combine the ingredients and taste the sauce. Add salt and pepper to taste. Allow to cool slightly and toss with the pasta and chopped basil leaves. If the sauce is too dry to mix well with the pasta, add more oil. Serve at room-temperature to 2-4 friends and loved ones in the middle of nowhere. Hey, is that a penguin skin floating in the water? We had been trying our best to have a good time at Taronga Zoo for hours. But after seeing animals roaming relatively free at wildlife sanctuaries in NSW and Queensland, Sydney's Taronga Zoo felt eerie. It felt like a zoo from another time, a darker time; all the animals were separated from each other and kept in small enclosures. Even the birds were in netted aviaries. It was like a living specimen collection, each box with a scientific label; there were no pretensions to "natural habitat." Several adult gorillas were kept in a small concrete enclosure that could never correspond to gorilla territory size, and they didn't seem to have any private areas. One lonely Kodiak bear slowly paced his tiny living space, watching us as we watched him; we moved on, and he kept pacing. The whole philosophy of how the animals lived there felt outdated and wrong. Not many people had our sense of adventure. Getting to Taronga Zoo from our place means a ferry, and on a cold day, a ferry means the freezing seabreeze I have come to associate with Sydney. We braved the ferry and the drizzly outdoors, and we felt like were the only people in the whole zoo. Alone, our small group (7 brown people and one very tall ginger) talked and wandered the deserted zoo, making our way past the Australian nightlife exhibit, the birds, the elephants, and finally, the aquatic exhibits. The viewing area for humans was underground, allowing a wall-sized window into a depressingly blank underwater world. It was a huge tank, just glass and bright blue water. I'm sure a filtration system hummed in the background, and dead fish were thrown in routinely. The zoo was about to close when the leopard seals came. Enormous, they swayed in the water, pushing their noses down so we could see their whole bodies. It was the most eerie and ominous display I've ever seen in my life. They were just undulating in one spot, looking at us. It felt like they were showing us something...but what? Mesmerizing, hypnotizing, I didn't want to stop watching them. I wondered if the zoo visitors were the only entertainment these terrifying creatures had in their blank blue days. Reading up on the leopard seal, my terror and fascination has only grown. Their only natural predator is the killer whale. They eat penguins in what now tops my list of "50 Most Awful Ways to Die:" by thrashing the penguin back and forth "until the skin peels away. The remaining carcass is then consumed." Wikipedia states that for leopard seals in the water, there is "a fine line between curiosity and predatory behavior," and although the first known human fatality from a leopard seal was only in 2003, "numerous examples of aggressive behavior, stalking, and attacks on humans had been previously documented." It's been theorised that mythic stories of mermaids originated from lonely sailor's sighting of seals on far off rocks; the myths say mermaids hypnotised sailors, distracted them, causing them to crash the boats and fall to their (skin-peeled) deaths. At Taronga Zoo, we watched them sway and I felt transfixed. I couldn't stop watching, trying to tell if they were performing, or playing curiously. Honestly, it felt more like they were threatening...predatorily. An announcement over the loudspeakers saved me: Taronga Zoo was closing for the night, and the seals swam away for their evening feed. Craig and I aren't strictly vegan these days, but we do enjoy eating vegan when we can find or work out a recipe; which is to say, most of the time. Anyway I found this on a number of vegan blogs; it seems to have originated from Bittersweet. Apparently, food blogs everywhere have been putting around an "Omnivore's Hundred" list, or a list of foods every omnivore should try; well, vegans being the competitive food-types they are, have put together their own list. I like when other people make lists of small-time accomplishments like this; it makes me feel very productive. It's like when people list the Top Ten Movies You Must Watch Before You Die, and two of them are John Hughes flicks (may he sleep well). You can't help feeling like you've ticked something off your list...even if it was a rather insignificant thing that wasn't really on your list until someone else wrote up a list. Anyway-- here it is for us...how about you? Bold Italics = we've both eaten it! 56. Gnocchi-- see tomorrow's post! 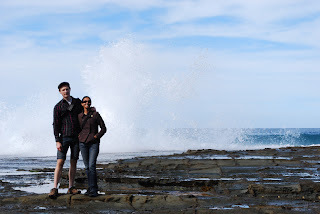 For our 7th anniversary, Craig did some research and found a lovely bushwalk in the Royal National Park, which is only about an hour's train ride from Redfern Station. We planned to leave in the late morning; we went to the grocery store, bought some supplies and sat down to a beautiful cup of coffee before heading to the train station. Craig gets a call-- it's Vix, of Vix and Ruby fame! They said, "We're heading down to the Royal National Park for a bushwalk-- what are you doing?" Craig skeptically says, "We're heading down to the Royal National Park for a bushwalk..."
They offer to take us-- Vix says, "I really want a coffee right now." Craig, incredulously, says, "We're having coffee right now...we can order you some?" It was a weird start to a wonderful day. 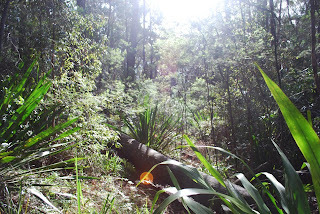 We went to the beautiful Royal National Park and took a few amazing hikes in the area. A crazed mama masked lapwing kept swooping people walking on the beach. Apparently her nest was nearby and she was NOT taking any risks. We went to a boardwalk called Wattamola, and had a delicious picnic; in true vegan form, Craig and I had brought way too much food for ourselves. It was lucky Vix and Ruby happened along to help us eat it. As the four of us talked about our lives, I brought up Emily, my childhood friend. She lives in Ireland now, and she recently sent me a care package including several hilarious 45s by awesome bands, such as "Los Tres Sudamericanos" and "Joe Dolce." I told Ruby, "You wouldn't believe it; Joe's single is called Shad--"
"SHADDUP YOU FACE!" Ruby sings. You guessed it. Ruby already knew about this single. She said it was a huge Australian hit. Joe Dolce was in fact an Italian-Australian who made his career by playing an Italian stereotype on a low-budget talent show in the 70's. My friend in Ireland sent it to me here in Australia, and there's no way Emily knew about this. Why you looka so sad? It's a nice-a place--SHADDUP YOU FACE! Our magical warm winter streak is still going strong; we haven't had rain in weeks. People have actually had to water their gardens! pshaw. Then yesterday, a brief, half-hearted shower in the afternoon threatened to break the spell; I worried about getting home on my bike. Suddenly, the sky changed. It looked on the verge of implosion, unnatural. The sky looked like the way it will right before the apocalypse. The witchcraft was getting stronger. The sky was a washed-out orange sherbet. Huge messy clouds ran into each other and a rainbow traversed the whole city. I expected Wuthering Heights-scale storms, I expected operatic lightning and thunder you can feel in your bones. This morning, I woke up to a perfectly calm and bright sunny day, and I don't know what to make of it. I'm waiting for the other shoe to drop. I really hope Kirk Cameron isn't right about that whole Rapture thing, though. Also, I've been getting some complaints that I don't update the blog enough. So, I am going to commit to putting up at least one post every day this week. 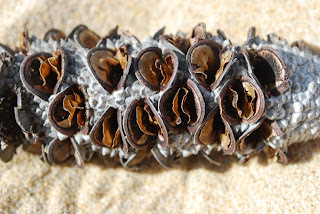 Usually I try to wait until I have a few interesting and related thoughts to present to you, but now, you will just get some rambling unrelated thoughts, but hopefully it will satiate those who are more interested than they should be. Look out for tomorrow-- it's your favourite power-couple's 7th anniversary, and I just got my first present: Season 2 of Flight of the Conchords! Isn't Boy Wonder shiny? And I'm not referring to his alabaster pallor.